← What is Jazz Music? In my opinion, this lean cut of beef really benefits from the “low and slow” method of sous vide cooking. It turns what can be a dry hunk of flesh into something every bit as tender, juicy, and tasty as prime rib. 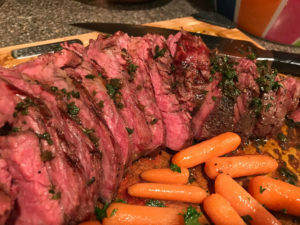 In fact, I call it “the poor man’s prime rib!” If you haven’t yet delved into sous vide cooking, there’s a great introduction to it here. You can pretty easily get the needed equipment on Amazon for under $100. Generously season with sea salt and cracked black pepper. My rule of thumb is a half teaspoon of sea salt per pound of meat. Pre-heat water bath to 130°F. Vacuum seal the steak or seal it in a heavy duty Ziploc freezer bag using the water displacement method. Place bagged steak in water bath and cook for 6 hours. Make the board sauce: Strip the thyme leaves from the stems. Chop the sage, thyme, garlic (I use a garlic press), jalapeño, and black pepper, and put it in a bowl. Drizzle the oil on the pile and let it sit while you cook so the oil can draw out some of the flavor. After 6 hours, remove steak and pat dry with paper towels. Brush both sides of the steak with some of the board sauce. I try to make sure there is a good portion of herbs on the meat. The flavor of the herbs will amplify during searing. Keep the rest of the sauce for your cutting board. Fire up your grill. Get it as hot as you possibly can. I throw on wood pellets or chips to generate some quick smoke just prior to searing the steaks. Sear each side for about two minutes. Rotate and move as necessary to control flare ups. You want nice dark brown markings on the meat (not black!). When the steaks are almost ready, pour some of the board sauce onto the cutting board. A board with routed channels is best to hold it in. Carve the tri tip in thin slices against the grain. Spoon remaining board sauce over the tri tip. Work some of the sauce between each piece. Serve immediately!